The largest log cabin in the world comes with a price tag of 40 million dollars and an unusual name of Granot Loma. 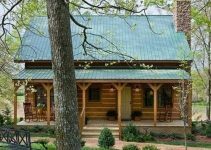 The 26,000 square foot log home mansion took four years to construct and was designed by 22 architects. It is located on almost eight miles of land, in Michigan’s Upper Peninsula. The name of the estate – Granot Loma, is a combination of letters from the original owner, Kaufman’s three children’s names; Louis, Graveraet and Otto, and his wife Marie. 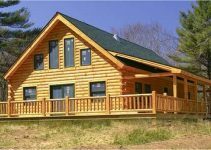 This luxurious log home, which sits on the shoreline of Lake Superior, has 23 bedrooms, 13 bathrooms and is exquisitely built with a lot of unique details. The 60 foot great room has a chandelier made from a white pine tree that Kaufman played under as a child which is now adorned with carvings of over 50 animals and people. 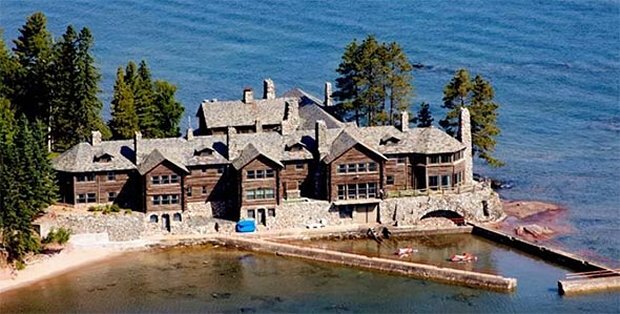 It also has a 30 foot long fireplace, the stones personally chosen by Marie Kaufman by instructing divers on which ones to select from Lake Superior and the mantel is made from a salvaged sunken ship in the lake. This incredible property also has many other buildings, to name a few: four apartments, a tennis court designed by tennis champion Bill Tilde, a farm, an orchard, a pool and pool house. This is truly a one-of-kind superb log home for rich and famous. 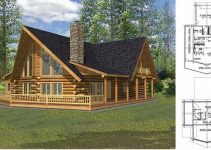 Us regular folks; however, will always have the option of building or owning a log cabin.